© 2002, Cisco Systems, Inc. All rights reserved. There are no special commands to make a router an Area Border Router (ABR) or Autonomous System Boundary Router (ASBR). The router assumes this role by virtue of the areas or autonomous systems to which it is connected. 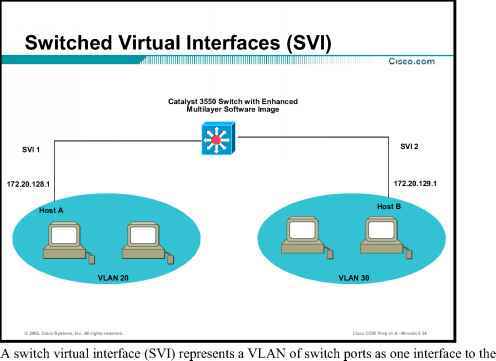 If a router has interfaces in different OSPF areas, it is an ABR. 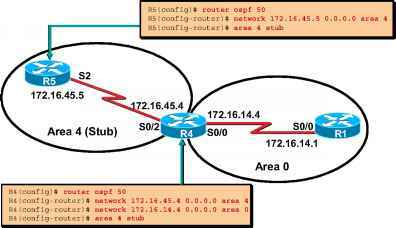 If the router has an interface in OSPF and an interface in another routing protocol and is performing redistribution of that protocol into OSPF, it is an ASBR. In the example above, Area 4 is configured as a stub area. No external routes (Type 5 LinkState Advertisements (LSAs)) from the external autonomous systems (other routing domains) will be allowed into the stub area. The area 4 stub command on each router in Area 4 defines the stub area. Each router in the stub area must be configured with the area 4 stub command or neighbor adjacencies will not be formed. Designates this router as part of a stub area. Performed in router configuration mode. The only routes that will appear in R4's routing table are intra-area routes (designated with an O in the routing table), inter-area routes, and the default route (these routes will be designated with an O-IA in the routing table). In this example, the keyword no-summary has been added to the area 2 stub command on R3. This keyword causes summary routes (inter-area Type 3/4 LSAs) to also be blocked from the stub area. Each router in the totally stubby area will pick the closest ABR as a gateway to get to any destinations outside of the area. The only routes that will appear in R4's routing table now are intra-area routes (designated with an O in the routing table) and the default route. No inter-area routes (designated with O-IA in the routing table) will be shown, except the default route. Prevents an ABR from sending summary link advertisements into the stub area. Use this keyword to create a totally stubby area. Performed in router configuration mode. Note The no-summary keyword is only required on the ABRs connected to the totally stubby area. The internal routers within the stub area only need to be configured with the area stub command. In the network diagram above, Area 4 is defined as a stub area. R5 also connects to a Routing Information Protocol (RIP) network and therefore qualifies as an ASBR. However, the RIP routes cannot be propagated into the OSPF domain, because Type 5 LSAs are not allowed into a stub area. 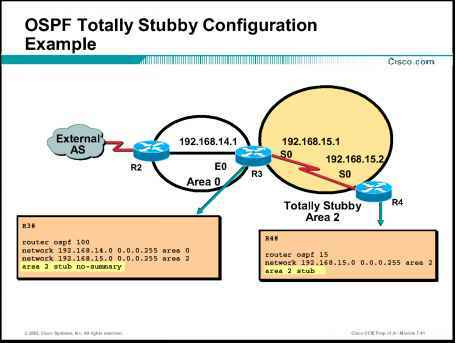 In order to redistribute RIP information into OSPF here, we must define area 4 as a special type of stub area called a not-so-stubby area (NSSA). Since Type 5 LSAs are not allowed into a stub area, the NSSA ASBR generates Type 7 LSAs instead, which are flooded throughout the NSSA. The Type 7 LSAs get translated into Type 5 LSAs by the NSSA ABR and are propagated into the OSPF backbone. Redistributed Enhanced Interior Gateway Routing Protocol (EIGRP) and Interior Gateway Routing Protocol (IGRP) routes from other areas in the network are still not allowed into area 4, because a NSSA is just an extension to the stub area, and all the characteristics of a stub area still exist, including disallowing Type 5 LSAs. Configures a stub area that contains an ASBR to allow external routes into the stub area as Type 7 LSAs. The no-summary keyword is used to create a totally stubby NSSA. Performed in router configuration mode. NSSA no-redistribution can be used to stop redistributed Type 7 routes from being flooded in the NSSA area. Further, no-summary can be added to stop Type 3/4 LSAs from being distributed except for the default route Type 3 summary. (Optional) Used when the router is an NSSA Area Border Router (ABR) and you want the redistribute command to import routes only into the normal areas, but not into the NSSA area. Performed in router configuration mode.